And now, the Spotlight is on YOU as we ask you to TAKE A SEAT! As we look forward to our 18th season (wow, how time flies when you are having fun!) we look forward to bringing another season of affordable, quality theatre to our summer fun! While the quality of our shows continues to improve not so for the chairs we invested over a decade ago. The fabric was frayed,the metal legs were bent and cushions had lost their “cush”. 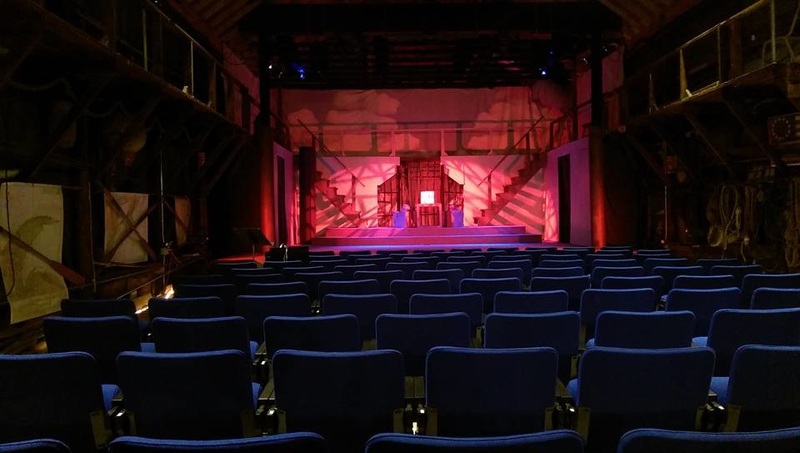 To make LST the best for our patrons, we invested in new comfy chairs, risers, and an ADA ramp to improve views along with a state of the art digital sound system. We are grateful to MCACA/NEA for their support for the Arts in Michigan and specifically for funds toward these improvements. As always however, we are required to step up and raise matching funds for these grants which have severely impacted our cash flow funds. 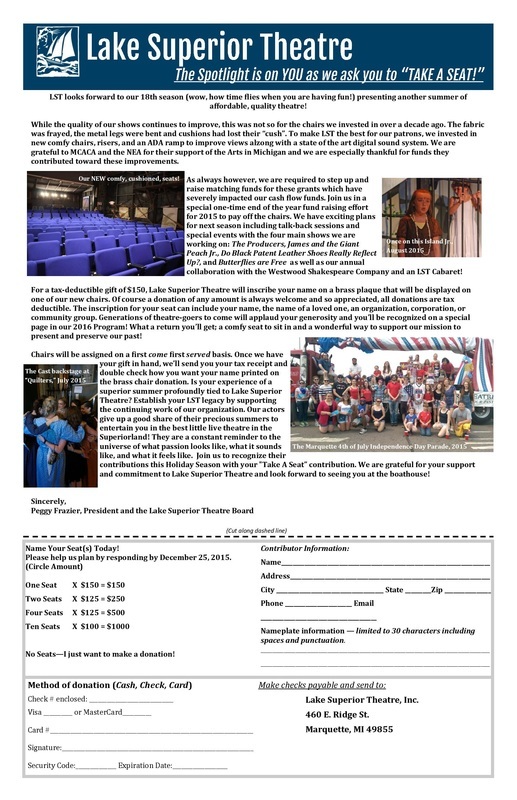 Join us in a special end of the year fund raising effort this year to pay off the chairs and put us in the best position for an incredible 2016 season! We have exciting plans for talk-back sessions for opening nights and special events in addition to the four main shows. For a tax-deductible gift of $150, Lake Superior Theatre will inscribe your name on a brass plaque on a chair. The inscription for your seat can include your name, the name of a loved one, or an organization, corporation, or community group. Generations of theatre-goers to come will applaud your generosity! And what a return you’ll get; a comfy seat to sit in and a wonderful way to support our mission to present and preserve our past!Designation of the chairs will be first come, first serve and we look forward to you making that connection by donating money for a chair? Or two ($250)? Or four ($500)? Or ten ($1000)? Of course any donation in any amount is welcome and so appreciated. You can mail a check or visa information to this address: LST 460 E. Ridge St. Marquette MI 49855 or call906 227 7625 if you prefer or have questions . Once we have your gift in hand, we’ll send you your tax receipt and double check how you want your name printed on the brass chair donation. This would also be the perfect opportunity to recognize one of your favorite performers of course! Just a few things. We ask that you send in your donation by December 25th, that no more than two people go in together on a chair, and that you let us know who to celebrate! Is your experience of a superior summer profoundly tied to Lake Superior Theater? Establish your LST legacy by supporting the continuing work of LST. Our actors give up a good share of our precious summers to entertain you in the best little live theatre in Superiorland; they are a constant reminder to the universe of what passion looks like. What it sounds like. What it feels like. Join us to recognize their contributions this Holiday Season with a Chair Take A Seat contribution. We are grateful for your support and commitment to Lake Superior Theatre and look forward to seeing you at the boathouse!